Add your email address to our list for future updates. 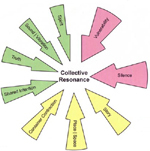 You are invited to tell us about your own practice of resonance. What have you done, what have you learned, how has resonance impacted your life? Please take a few minutes to complete our submission form, and let us know about your experience. Be sure to click the "submit" button when you are done, to save your information to our database. We will be most appreciative of your contribution, and if we feel our readers would enjoy your offering, and if you give us your permission, we will consider displaying it here on the Resonance Project web site. Thanks so much for being here -- we look forward to getting to know you! May we have your permission to display this practice on the web site? To prevent robots and spammers from entering inappropriate information, please enter the letters of this image in the order they appear from left to right. This site offers four main portals. © 2005, The Resonance Project  All rights reserved.